Pierre-Simon Laplace, also known as Marquis de Laplace, was a French astronomer and mathematician who became famous for his theory regarding the beginnings of the solar system. Laplace was born in Beaumont-en-Auge, a village in Normandy. His father was a farmer, but Laplace was able to have a good education thanks to wealthy neighbors. Laplace’s father wanted him to become a priest, so he was at first sent to Caen to study for the priesthood. However, his enthusiasm soon turned to mathematics. Because he excelled in this subject, Laplace became a mathematics professor at the Ecole Militaire in Paris at the early age of 20. The income from this teaching job allowed Laplace to concentrate on research in astronomy. He was one of Napoleon Bonaparte’s teachers, who later recognized and rewarded him for his work. But the friendship between the two men was often fraught. In 1788, Laplace married a young woman somewhat younger than he was, and they had two children. When Laplace’s daughter died, Napoleon’s lack of empathy estranged him from the emperor. In his Exposition of the System of the Universe, written in 1796, LaPlace started with a theoretical primitive nebula as the origin of the solar system. He believed that this huge cloud of gas rotated, cooled, contracted and birthed planets and satellites. The remaining material formed the sun. Laplace’s nebular hypothesis was accepted for a long time, but has now been replaced by more modern and accurate theories. 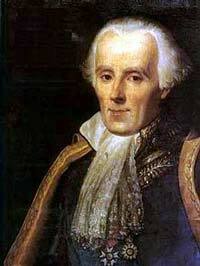 Marquis de Laplace also contributed to studies in mathematical astronomy. Sir Isaac Newton had explained the movement of the solar system in general, but he had not solved all of the questions because the mathematical tools were not invented yet. Even Newton claimed that some aspects of how the solar system worked were just due to the will of God. Laplace wished to reject this belief and he eventually accounted for the intricacies in the movement of the bodies and wrote about this in his Celestial Mechanics. In this multi-volume work, he summed up achievements in theoretical astronomy from the time of Newton. The books deal with equilibrium, the movement of fluids and solids, the law of gravity, and planetary mechanics. Laplace also discovered the stability of planetary orbits. He said that any eccentricities there were in a planet’s orbit were inconsequential and they always tend to correct themselves. Laplace also theorized the existence of black holes. He believed that there were stars whose mass was such that not even light could escape the force of their gravity. He also believed that some of the nebulae that he saw through telescopes might be their own galaxies and not part of the galaxy to which the earth belonged. For the time, these theories were quite farseeing, as the existence of other galaxies was not even confirmed until the 20th century. Laplace was a member of several prestigious scientific organizations, including the Academie des Sciences, the Ecole Normale, and the Bureau des Longitudes, which he helped begin. He also became a count in 1806 and then a marquis in 1817. Laplace died on March 5, 1827, while in Paris. His doctor removed his brain and it was on exhibit for several years thereafter.